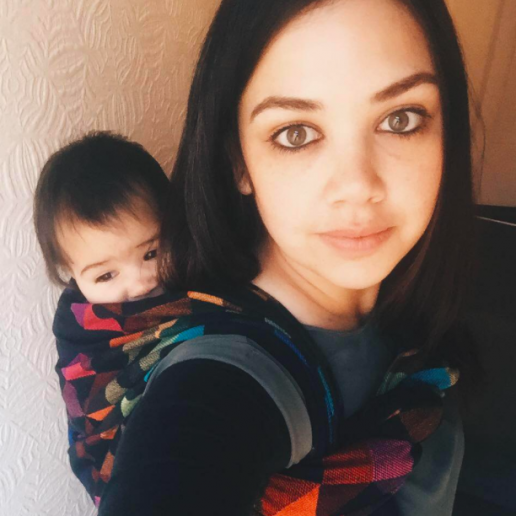 Nafeesa tells us about Ramadan and her experiences of babywearing during this holy month. Parenting isn’t always easy. A poorly child who wants nothing more than cuddles, a grumpy child who for whatever reason cannot be consoled, a parent who is feeling touched out or is sleep deprived may not necessarily feel like having the responsibility of parenting that particular day. We all have challenging days as parents and it is part and parcel of the family narrative that we create. Now imagine if you were having a challenging time but you were not eating or drinking all day, particularly in the summer? Or you were trying to console a sad child knowing full well you desperately needed them to settle so you could catch some quiet spiritual contemplation? Such is the life of a Muslim parent. Since the end of May this year (2017), Muslims all around the world (including those in Sheffield) have been observing the holy month of Ramadan and without a doubt these will have been issues that have cropped up during this time. For most people who are not Muslim, Ramadan is automatically associated simply with not eating or drinking. However, in fact it is about much more than simple fasting. Whilst fasting is expected for every Muslim who is physically capable to do so – it is only one component of a month that brings in spiritual gain in generous amounts. For Muslims, Ramadan is a time to spiritually check in, audit our souls and put plans in place on how to be the best people we can be in the year beyond. It’s for this reason that we love Ramadan so much. It’s our chance to reap good deeds. Unfortunately parents of small children find themselves having to juggle the needs of their children with their own spiritual needs and many parents, including myself, wish we had the extra time to engage in Ramadan more effectively. In my experience using a sling can really help. As a mother of three, including a 5 month old baby, having a sling on hand has ensured I’ve been able to work a little more effectively at getting jobs done quickly so I can engage more time in ibadah (worship). It means that my little one can be kept more calm during “the witching hour” while I tend to my other two, and get iftar (the meal which we break our fast with) ready on the table. Four years ago, I found myself fasting in the summer months with my two year old (as an aside, Ramadan does not always fall during the summer, but currently is and will be for the next couple of years). I have a very fond memory of walking 2 miles with a heavy toddler in tow on my back on a hot summer’s day. I remember looking at my watch at 2.30pm thinking “I have seven more hours of this to go” (fasting). It would be easy for anyone to read that and immediate feel sorry for me or think I’m mad for inflicting difficulty on myself for my conviction. One of the biggest micro-aggressions Muslims face are well meaning but ill-informed comments of pity for our choice to fast. The fact is that all who are physically capable of doing so are expected to fast, but there is an element of choice for those for whom it may be too debilitating (for example, with medical conditions, while pregnant or breastfeeding). Fasting is a physical endurance that gives me the opportunity to cleanse my insides both physically and spiritually. 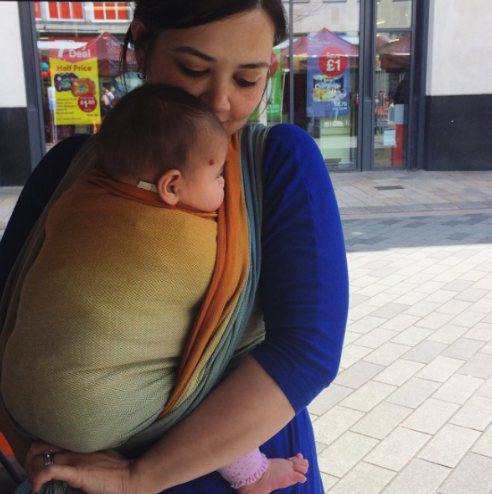 Fasting and babywearing do not need to be mutually exclusive and ultimately it is no one’s call but the fasting parent’s to determine what they can and can’t do. Ultimately Ramadan is a relationship of deep connection between the individual and their Creator. It’s not my place, your place or anyone else’s to advise a fasting person what they should do. 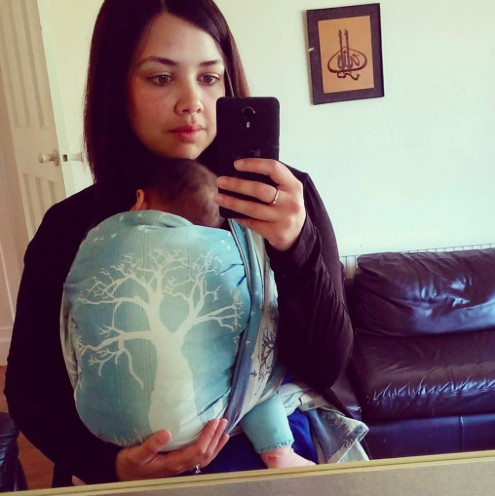 I chose to babywear four years ago while fasting, as I felt well enough to do so, I did not feel faint and I knew I could keep my children safe that way. This year, as I’m exclusively breastfeeding a small baby, I took the decision not to fast. 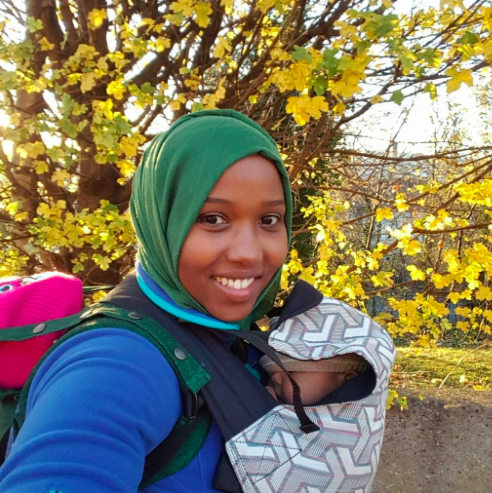 Babywearing is an amazing way to share the joy of Ramadan with our little ones. Even if no words are spoken, Ramadan is an opportunity to reap good deeds and build connections. I have enjoyed carrying my baby girl everywhere, speaking and meeting new people, sharing iftar and attending prayers while having my little partner in tow, and now celebrating Eid-al-Fitr with my loved ones.